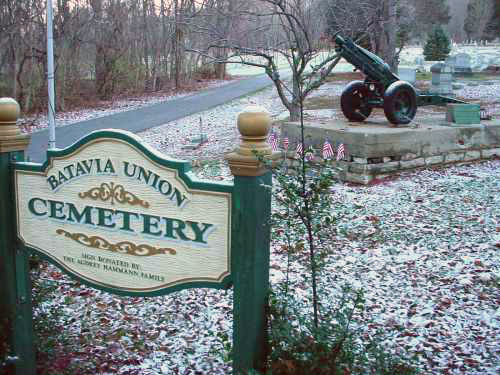 Went by an old familiar landmark nearby this morning and sighted an old graveyard gun still standing guard at the Batavia Union Cemetery in southern Ohio. 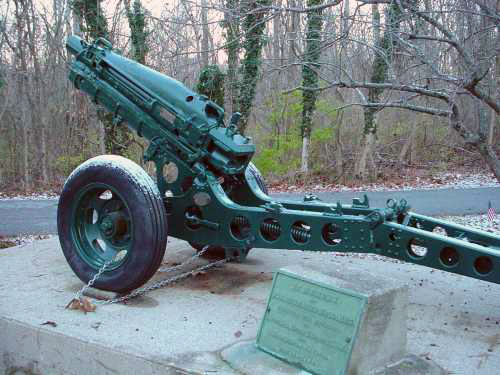 This gun is an old US Army 75mm pack howitzer, designed during the 20's to be able to cross rough terrain or be packed on horseback or mule if need be. Only 90 guns were built prior to 1940 due to fiscal conservatism by the US Government, but production ramped up big time in WW2. This gun has the M8 carriage with pneumatic tires, but still could be carried by 6 mules. The later M3 gun dispensed with mules and moved on to jeeps and gliders only. Great Britain got over 800 of them in WW2, and also Australia and China. The Chinese connection is notable according to Wikipedia, the guns eventually made their way to the Viet Minh and were present against the French at the siege of Dien Bien Phu. This particular gun was donated to the people of Batavia recently by Gary Knepp, who gave it in the name of General Henry Clark Corbin, the former resident of Batavia and also who was Adjutant General of the United States in 1898, and confidant of Presidents. Gary had published the memoirs of the General, among other books including a recent one on Clermont County's dead from the Vietnam War, Beyond the Names. You can get these from his website.